When you publish a new blog post, how do you get the word out? Do you manually go to several different social networks and share your post? Sharing manually is nice because you can add a personal touch to each post, as opposed to sending out the same thing to all of your social network. However, it is also a time-consuming process. Some day, you just may not have the time to share your new content manually. To increase traffic to your blog, you might frequently post all the contents to social media such as Twitter, Facebook, LinkedIn etc. But it is annoying to tweet everytime you post a new article on your blog. In this content Share to World will teach you a simple way to Auto Tweet your new blog post on Twitter, Facebook, LinkedIn etc. easily using TwitterFeed. 7- Authenticate your Twitter, Facebook, LinkedIn account by clicking on Twitter, Facebook, LinkedIn etc and entering your username and password. 8- Click on Create Service. 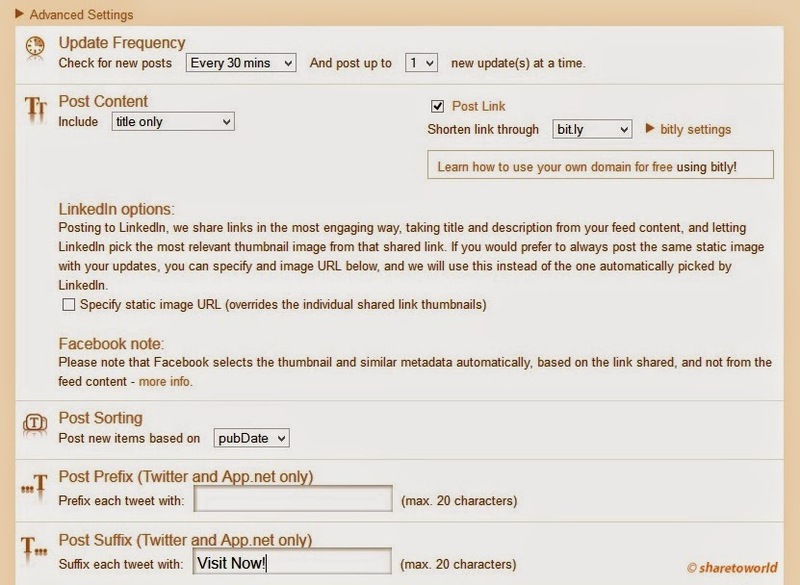 Now whenever you publish new post on your blog it will be automatically tweeted on your Twitter, Facebook, LinkedIn etc.